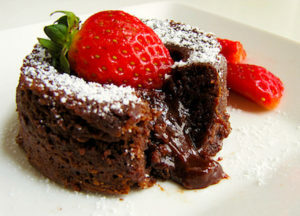 Chocolate Molten Lava Cake is the quintessential Valentine's Day dessert. This recipe won't disappoint you with it's melt in you mouth chocolaty sweet goodness. It takes just minutes to prepare. Made with coconut flour and sugar substitutes it's a low carb, keto diet friendly, dessert treat. Mix all ingredients, divide batter into 2 mugs/ramekins and microwave each for 30 seconds. Or bake at 400-450 F for 10-12 minutes, or until the sides of the cakes are firm but the centers are soft. Let the cakes cool in the ramekins for 1 minute, then cover each with an inverted dessert plate. Carefully turn each one over, let stand for 10 seconds and then unmold. Serve immediately. OPTIONAL: Garnish with fresh raspberries or strawberries in moderation for an added treat.